My crafty Christmas gifts this year were these market bags. I started well ahead of the holidays trying out many different patterns, and in the end, I came up with this one. 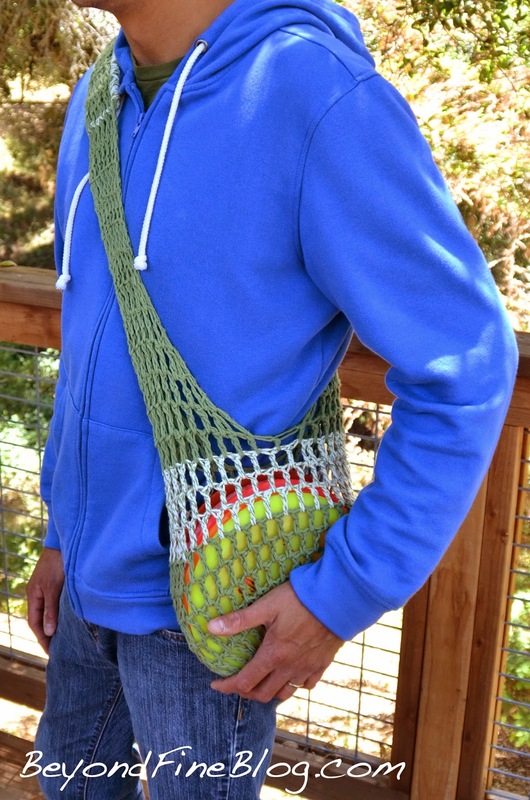 I suppose it's a mash-up of elements I found in the different patterns, but they're basic crochet concepts, so I don't feel bad claiming this one as my own. Overall, I think I made eleven basic bags and then the two other modified bags shown a bit farther down. I'll post my directions at the bottom. I don't know how to write a true crochet pattern, but I can do my best to explain how I made them. 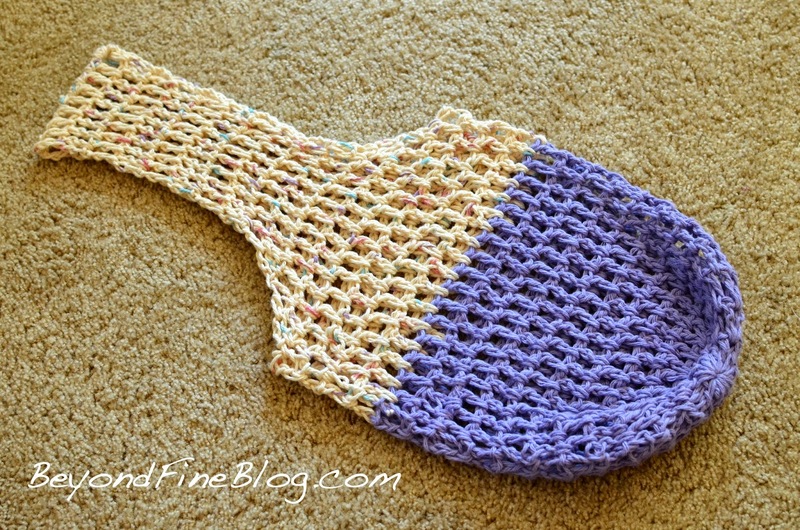 The key to this pattern is using a large crochet hook. I used a size P (10mm). I also used cotton yarn (Sugar’n Cream by Lily), which I also consider key to the look and feel of these bags. But the size of the hook is essential. 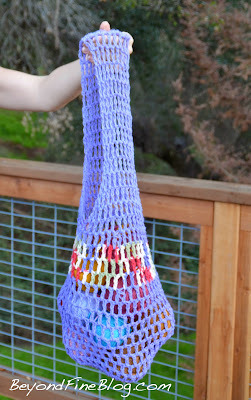 A small hook would make a small bag with no obvious mesh. The large hook also makes the project go really fast! It was a fun pattern to play around with variegated yarn, see what kind of stripes and patches of color were formed. I also experimented with stripes. two, three, or four rows, sometimes depending on how much yarn I had. I made this slightly smaller bag for my best friend for her birthday. I realize it doesn't look any smaller. 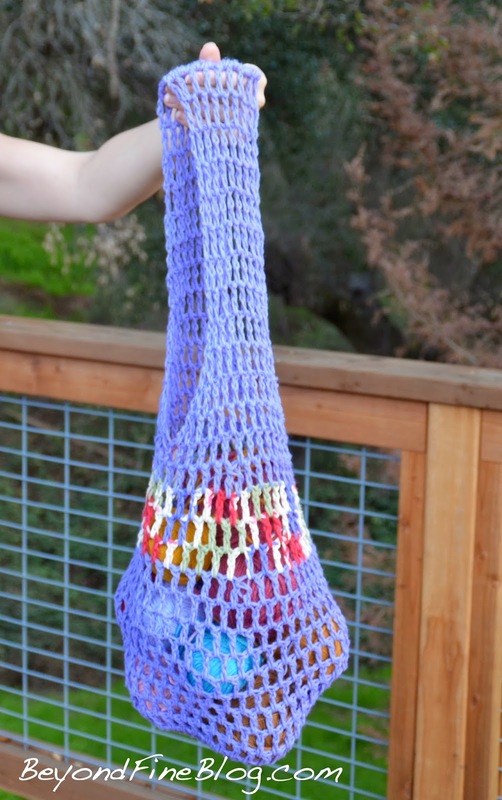 For the picture, I filled it with heavy groceries instead of the yarn balls used with the bigger bags. Oops! These bags stretch! My husband pointed out his favorite colors at the store and "hinted" that my pattern could make a really nice disc golf bag. I made the bag smaller and the strap much, much longer--longer than I needed, then folded the excess over and stitched around the edge to make a padded strap. On to the "pattern" . . .
chain 2, make 11 double crochets into the center, so it’s 12 posts counting the chain 2.
connect, chain two and turn piece (I’m not sure if this is necessary, but I read it in at least one pattern, and I did it for all my bags—too nervous to experiment with that aspect, I suppose). The next two rows are increase rows, so the very next row you do two double crochets in each space (you'll have 24 stitches, turn piece). The row after that, you do every other. So, two double crochets in one space, one double crochet, back to two, and so on (you'll have 36, turn piece). 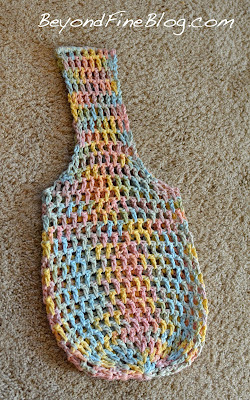 Put a double crochet in the first space of these two rows (with the chain 2) but not the first space of any other row. At least one pattern I read suggested putting a double crochet in the first space of every row (if I was reading the pattern correctly). This looks a bit weird. It creates an obvious seam down the side. The next eight rows are simply double crochets in each space (turning piece every row). Then I started adding in a few decrease rows. This was very unscientific and I’m sure there’s a better way. But . . . I put two decrease stitches in each decrease row, equidistant from each other. In the first row, I chained two, did one double crochet in the next space, then did one decrease stitch—where you start doing the stitch in one space but half way through skip to the next stitch and finish it there. Double crochet until the next decrease. With my design, I’d count the spaces till around 17, then do my second decrease stitch. Double crochet till the end, and there should be another 17 spaces. I wasn’t super strict about the counting. If I counted 16 and 18 spaces on either side of the decreases, that was fine (turn piece). The next row is regular double crochet (turn piece). The next row is another decrease row. This one is even less scientific. I wanted to space out my decrease stitches—I didn’t want them to line up vertically—so I’d start the double crochets and try to place my decrease stitch in between the decrease stitches two rows below. I’d count 7 or 8 spaces after one decrease stitch and place my decrease stitch in my new row above. I’d do the same thing for the next decrease stitch. between 7 or 8 stitches of the first decrease row, or 16 stitches from the other decrease stitch in this row. I wasn’t too strict about counting on this row either, but it worked out to 16 and 16 spaces if I was careful to make it even. One more decrease row. This one’s easy because I do my decrease stitches directly above my first decrease stitches. If even, there will be 15 spaces on both sides of the decrease stitches (turn piece). 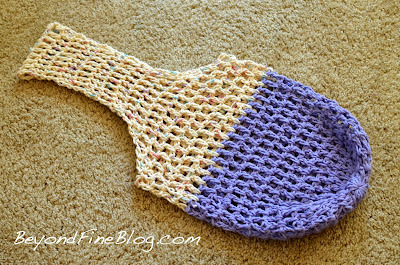 One last row of double crochet stitches and you’re done! . . . with the bag part. 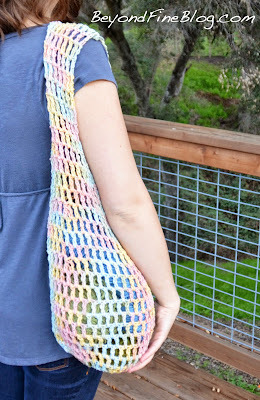 For the straps, it’s important that the opening of the bag has an even number of spaces between crochets so the straps will be even and the space between the straps is even. My bags ended up with 30 spaces around. If I ever messed up and had one less or one more stitch (I never had more, only less, but I suppose this could happen), I’d just add another stitch. It looks better to have a stitch crammed in at that point than to have unevenly spaced straps. 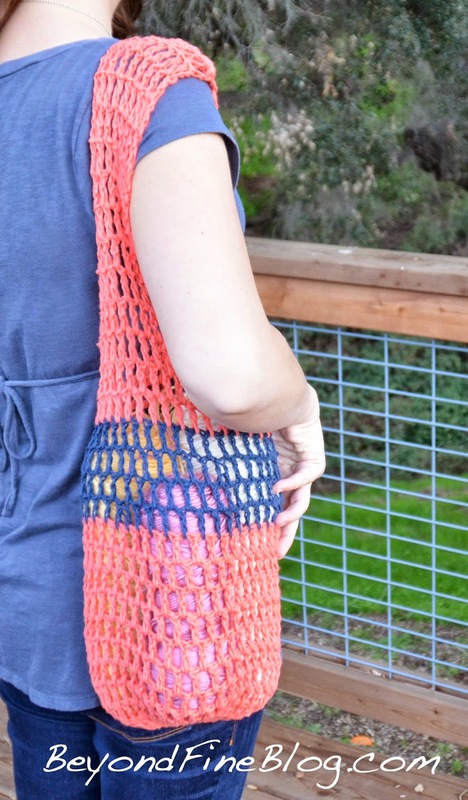 Stripe: I always went back to the main bag color for the last two rows, so if I wanted to do 4 rows of stripe, my first decrease row was the beginning of the stripe color. If I wanted to do 3 rows of stripe, I’d change to the stripe color after my first decrease row. Straps! 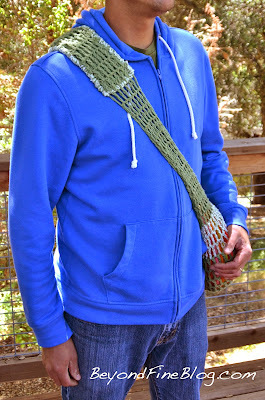 I liked this style of strap most because it looks so well integrated into the body of the bag. They also add a bit to the total capacity of the bag, so take that into account. I always centered the seam in the middle of one of my straps, but I’m wondering now if having the seam in-between the handles might look more natural. It’s a personal choice. So, if you center your seam, attach yarn with a slip knot, chain two, and make a decrease stitch. If you start from the seam, you can continue from where you are (no extra ends to weave! ), chain two, then do a decrease stitch. 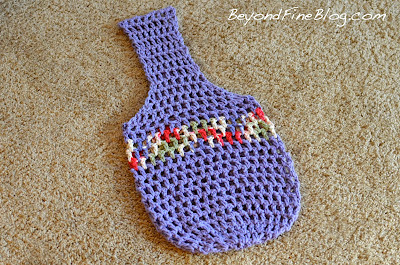 Double crochet along and finish with another decrease stitch. The number of spaces filled needs to equal half the total spaces available. Unless you want a bigger gap between your straps. I was happy with very little gap and a wider strap. 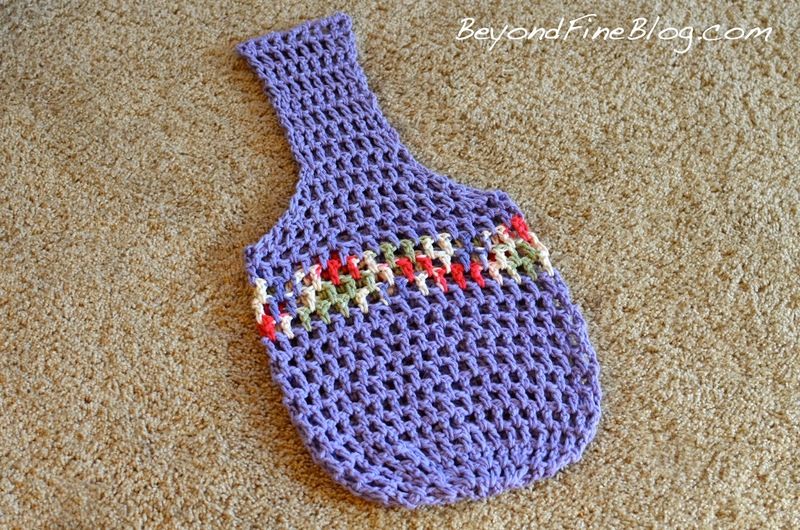 chain two and turn, decrease stitch, double crochet until the last two spaces where you will do another decrease. Do this until the strap is the thickness you’d prefer for the rest of the strap. I liked mine to be 9 crochets or 8 spaces wide. chain two and turn, 8 double crochets and do it again. 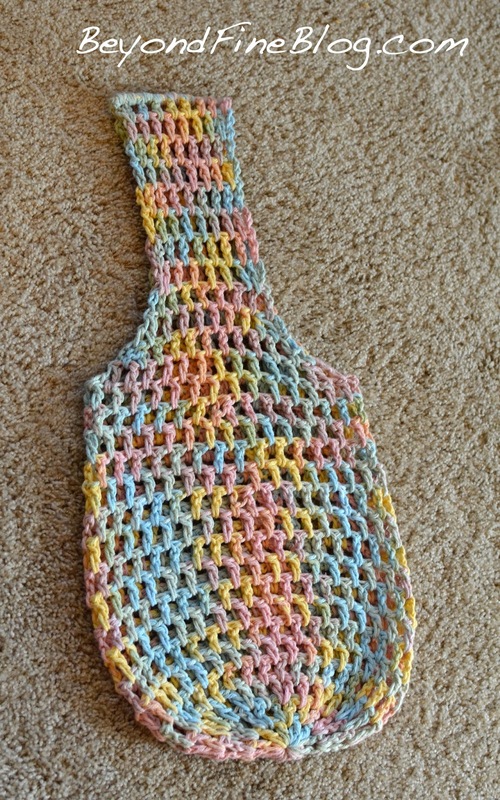 I like 8 rows of double crochet for the strap. Make a knot and leave a nice long end. Do the second strap exactly like the first starting directly in the next open space. 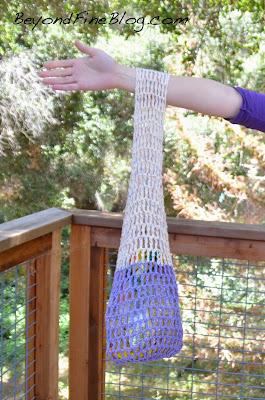 I joined the straps by tightly wrapping the ends through the crochet spaces. I liked to do it tight, so when I threaded the ends through the wrapped yard, they’d be held there tight. And, we're done! Sweet market bag.